Todays post should be a fairly short one. 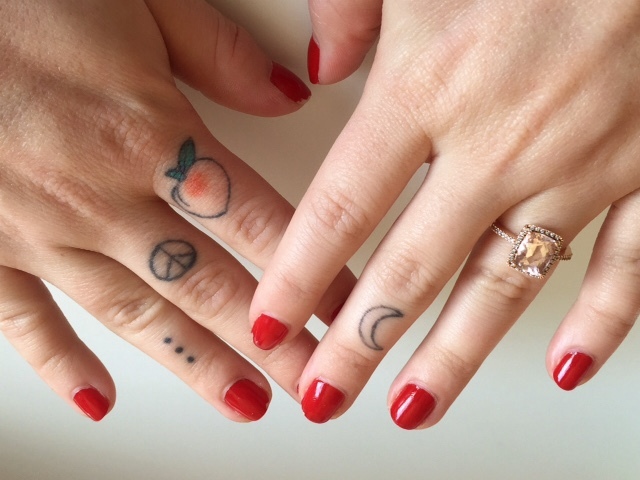 I'm going to be sharing my finger tattoos minus the exception of a couple that I have already talked about on a previous post and one that I will be sharing on my next post. Let's start with the more meaningful pieces. 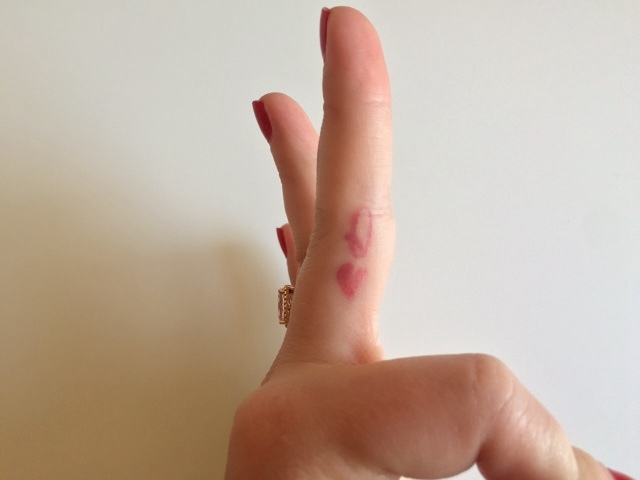 On the inner side of my finger I have a Q with a heart just below it. This is a matching tattoo that Rudy and I got. On the same exact finger Rudy had a K with a heart below it. This tattoo I have seen a few people before me get this and many people after me. I seen a photo of this on a couple on Pinterest one day and thought it was such a cute, fun, and meaningful tattoo for Rudy and I to get. He is the King to my heart as I am the Queen of his. This spot is a bit more painful than the knuckles and this spot was super quick. This spot also fades a lot faster than the knuckles I've noticed and I have already had this touched up twice and need to go once again to fix it up. Even though that is such a pain I still really like it and touch ups are free so I really don't mind it at all. This was done by Jason along with the next two I'm going to talk about. 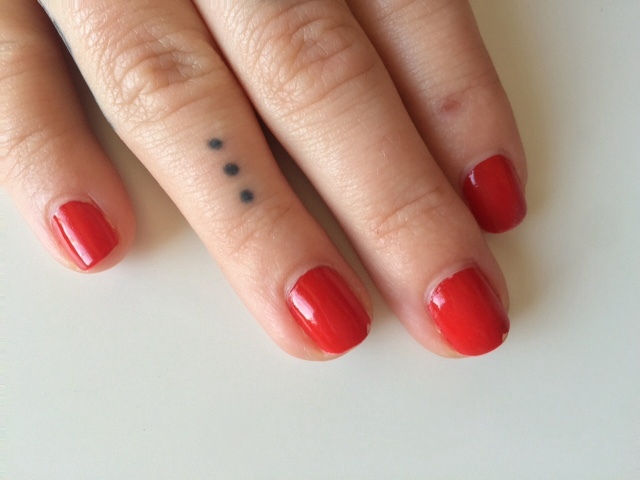 The second tattoo on my finger that is meaningful is this three dots. These three dots are the 'ellipsis'. It is the three dots you see at the end of "To Be Continued...". It is a punctuation mark, one of continuance. It means 'to be continued' that there is more to come. You're story isn't finished yet, and you won't know what could come if you're not here to see it. This very tiny little piece is one that has such a great amount of meaning same as my arrow. When I am feeling down or in a slump all I have to do is look at it and remind myself I am still here in the world for a reason. There is still so much to come and that my story is clearly not over yet. This was one of my random tattoos. 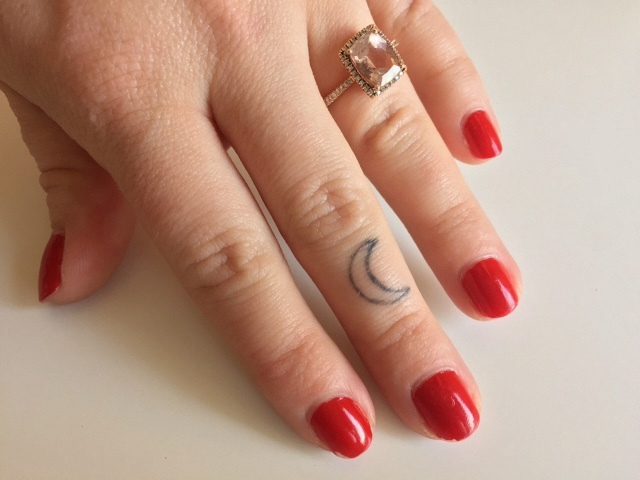 I think this was while I was also getting the crystal ball on my leg or when I got the rose on my foot, I got this half moon on my finger. There is no meaning behind it just something I thought and still think is cute and I wanted to get one on my finger. So that's what I did haha. There really isn't much else to say about it. It can use a little touch up and it has already been touched up once after I got it done. Last but not least, this next tattoo is one of my favorites because it's just so me. 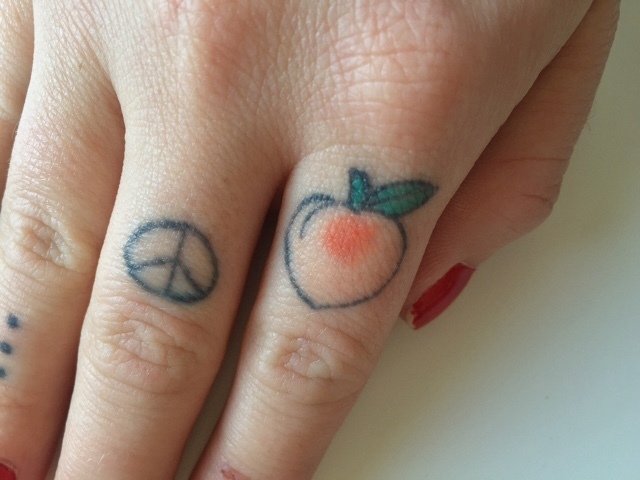 I finally added a little peach to my finger. If any of you know me you'd know the love I have for all things peach. It's one of my favorite fruits, taste, smell and color. I love everything peach haha. I love how cute this little gal turned out, it's exactly how I wanted it. It looks like the little peach emoji🍑 This piece was done by the same guy that did the red rose on my bicep. It still looks pretty great if I must say but it could use a little touch up to brighten up the colors a bit.